Formed in 1849, the Farnham and Hartley Wintney School District was one of the few such bodies set up under a Poor Law Commissioners' scheme to encourage adjacent Unions to operate combined Poor Law Schools for children whose parents were in the workhouse. The school also took children from the adjacent Alton union. 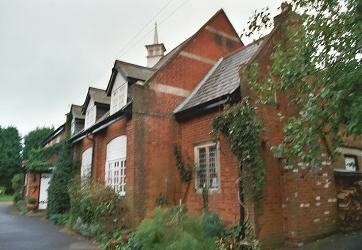 The DISTRICT PAUPER SCHOOL, for the pauper children of Hartley-Wintney, Farnham, and Alton Unions, is an extensive brick building, with stone dressings, situated about 2 miles S. of Crondall village, and 2½ miles W. of Farnham. It was erected in 1856, at the cost of about £7500, in lieu of the former District School at Aldershott, which was purchased by the Government in 1855, and converted into a Hospital for Soldiers. It has room for about 200 children, in two departments for boys and girls; and attached to it are 16 acres of land. The main building had an E-shaped layout, with the girls accommodated in the east wing and the boys in the west. Other buildings included a laundry, chapel and stables. 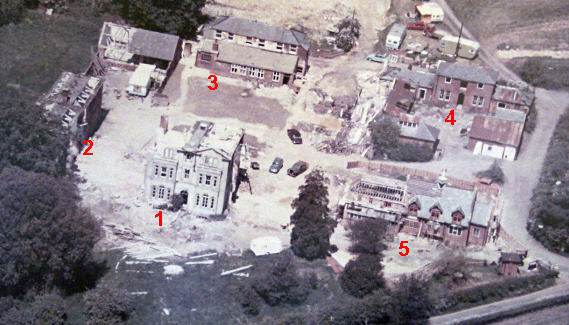 An aerial view of the site during redevelopment in the 1970s shows the buildings that remained at that date. Crondall aerial view from the south, 1970s. The school was later known as Wimble Hill District School. In 1948, the site was taken over by the National Health Service for use as a hospital. A block to the north-east of the main school (labeled "School" on the 1910 map) was used as staff quarters. 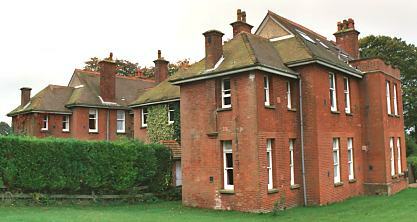 Crondall staff block from the north-west, 2001. The main block was in the 1970s. The chapel survives and has been converted to residential use. Bricks from the main school building have been used for the construction of the new "School House". Crondall chapel from the south-east, 2001. 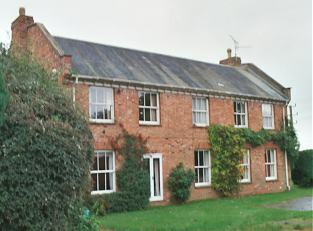 Crondall "School House" from the north-east, 2001. 1898 — Superintendent: John Gosling; Matron: Mrs Ada Gosling; Medical Officer: James Lorrimer. Hampshire Record Office, Sussex Street, Winchester SO23 8TH. Holdings include: Admissions and discharges (boys, 1846-70); Attendance registers (1852-96, with gaps); Journals of instruction in industry (1850-53); etc. White's Directory of Hampshire and the Isle of Wight, 1859. Thanks to Henry Collet for aerial picture and information on Crondall school site.